Termites are destructive wood-eating pests that form colonies and swarm in the spring as they set out to find a new home. Whether they make their homes in the ground or in wood, termites cause millions of dollars worth of damage to structures every year. Termites enter houses through exposed wood, cracks in a foundation or wood on or around a home. They're known as the "silent destroyer" because many homeowners don't know they have an infestation until the damage is already done. There are three main types of termites in the United States. Drywood termites prefer small colonies and make their homes in dry wood rather than the ground. Drywood termites come into the home via infested wooden furniture or through an exposed wooden area on the house itself. As their name indicates, dampwood termites prefer wood that has water damage or that's constantly exposed to moisture. Often found in logs and stumps, dampwood termites can also make their homes in exposed wooden areas that are prone to moisture. A roof or rain gutter can provide an attractive entry point for dampwood termites. Subterranean termites are ground dwellers. They live under the ground near exposed wood and create mud tubes to travel from their nest to the wood they're devouring. Subterranean termites enter homes through cracks in cement foundations. 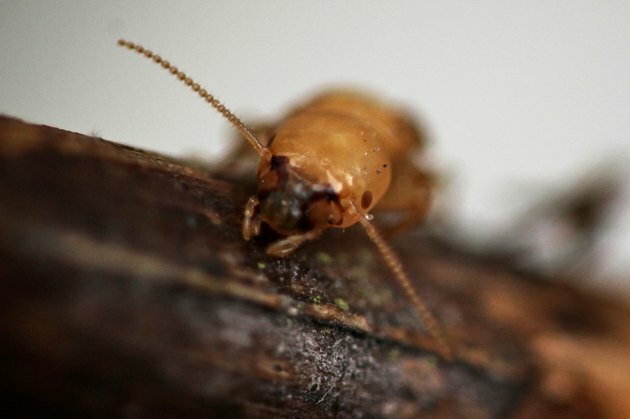 Most homeowners don't suspect they have termites at first. It's not until there are obvious signs of an infestation that they take steps to get rid of them. Swarms of winged termites around a home is a good indication that there's a colony nearby. "Swarmers" are attracted to light and are often mistaken for flying ants. As termites shed their wings, finding piles of discarded wings is another sign that termites are nearby. Subterranean termites travel from their nest to a home in tubes they build out of mud and debris. Seeing mud tubes in and around a home's foundation also indicates termites. Looking at or listening to exposed wood also offers clues. Termites eat wood from the inside, making it hollow. If a knock on the wood produces a hollow sound, termites may be present. Cracks and bubbles in paint or floor coverings can mean that termites are nearing the surface. By the time this happens, there's already serious damage to the home. To prevent an infestation, seal cracks in foundations and other exposed areas to keep termites from entering the home. Avoid water damage by making sure rain gutters and drainpipes aren't directly leaking onto exposed wood, and keep an eye out for leaking pipes or condensation that can cause damage. Use a dehumidifier and keep air flowing to prevent inside moisture. Remove stumps, rotting trees and wood piles that can attract termites outside the home. Avoid using wood-based mulches around a home. If there's already an infestation, there are some home methods to try. Wet cardboard is just as attractive to termites as wood. Saturate corrugated cardboard and put it next to a suspected colony. Once the colony infests the cardboard, burn it or wrap it in several trash bags for disposal. Parasitic nematodes are another way homeowners can deal with termites. Found in home improvement stores or online, nematodes are little worms. Plant them in the ground around a termite colony and they'll feast on the pests that are feasting on the home. Insecticides are a more effective method of termite removal. There are various products available, including poisoned baits and foams that penetrate nooks and crannies. Find termite removal products in home improvement and hardware stores, and be sure to read the label to find the best product for your needs. If all the above methods fail, or your termite problem is severe, call in a pest control professional. A professional can treat all access points and help secure a home against future infestations.